Chasing Roots: Tradition: Let's Get Our Yell On! Unlike nearly every other University in the United States, Texas A&M does not have a cheerleading squad. Why, you might ask? 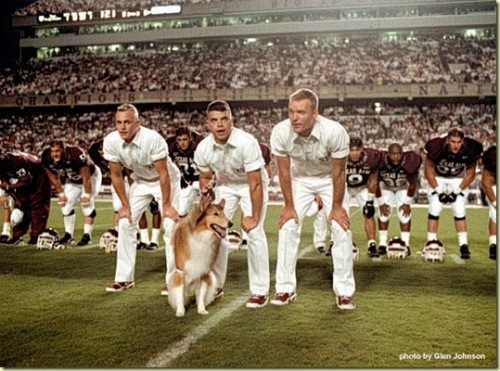 Because Aggies don’t cheer. 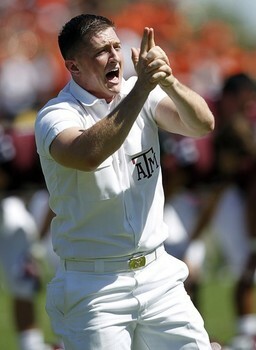 Aggies yell, and are led in their efforts by Yell Leaders. The original yell leaders (dating back to the very early 1900’s) were freshman who, having been instructed by upperclassmen to entertain fans during a football game, donned white janitor uniforms, led the crowd in yells, and told jokes from the track in front of the stands. 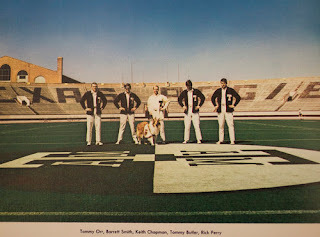 These charismatic freshmen became so popular with the student body and their female guests (TAMU was still an all-male military school at the time) that the upperclassmen decided to take the privilege of energizing fans for themselves. Today’s team of five Yell Leaders includes three seniors and two juniors, all elected annually by popular vote of the student body. 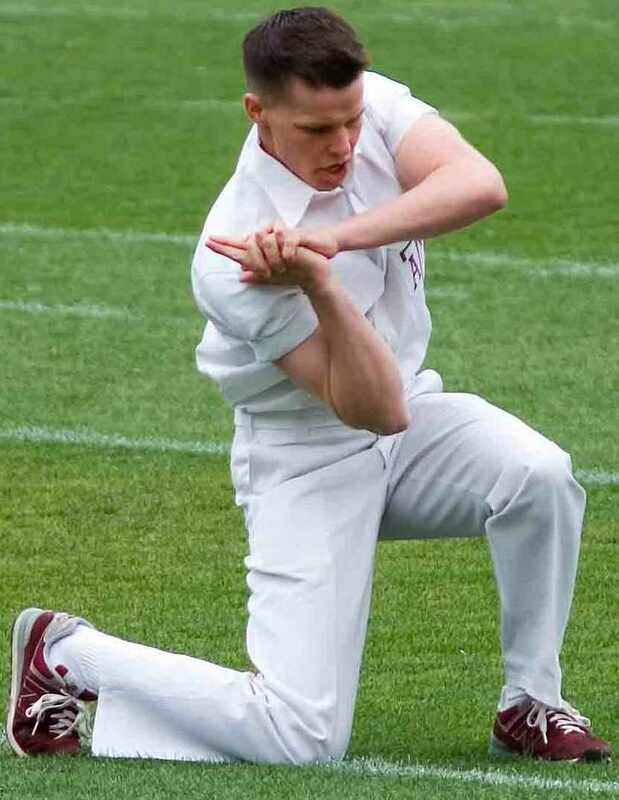 (TAMU is one of very few schools in the country that elect its spirit leaders, and it’s not uncommon for twice as many students to vote in the Yell Leader election than vote in the Student Body President election.) More often than not, Yell Leaders are Cadets, though membership in the Corps is not required. And while women have campaigned for Yell Leader positions, none have ever been elected. 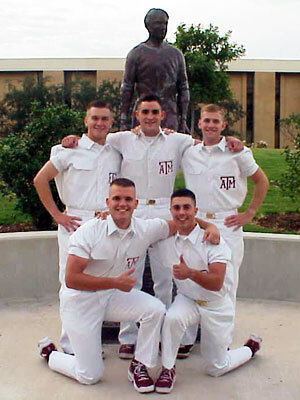 Fun fact: Texas Governor and presidential hopeful Rick Perry was a TAMU Yell Leader! Yell Leaders participate in all home and away football games, all home basketball games, many away basketball games, and selected home and away games for other sports. 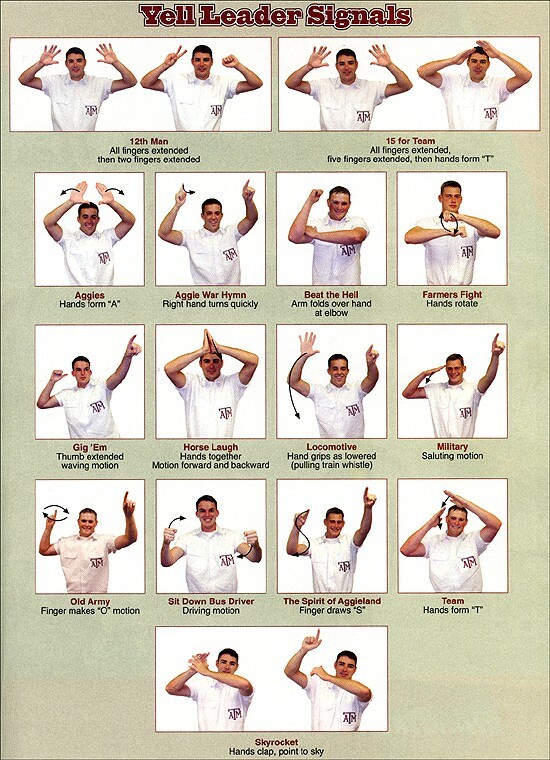 To direct the crowd, Yell Leaders use a variety of hand signals, called “pass-backs”. A pass-back signal made by the Yell Leaders is “passed back” through the crowd until word has spread and everyone knows which yell will be performed. 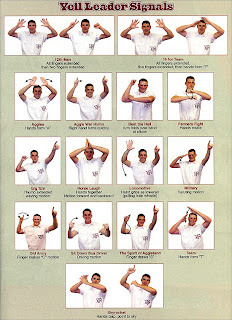 Once the signal is made and passed back, Yell Leaders signal for the crowd to “hump it” and begin the yell. Humpin' it, or leaning forward with hands resting above the knees, aligns the back, neck, and throat in a position that maximizes noise. After Aggie victories, Corps of Cadet members chase and catch the Yell Leaders and then throw them in a fountain of very cold water called Fish Pond. (Seeing as I spend most of my days wishing someone would throw me into a fountain of very cold water, I think being a Yell Leader on game day sounds like a pretty good gig.) Aggie fans follow the band out of the stadium and to the YMCA, where they’re joined by the soaking wet Yell Leaders, for a short rally. 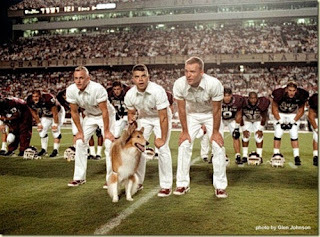 I'd love to see my kids, 14-16 years from now and if sports don't work out for them, skip cheerleading (I don't think this will be problem for Will, but you never know about Little Miss Bossy Pants) and campaign to become TAMU Yell Leaders. Heaven knows that if voice volume is even 50% of what the student body considers when electing their Yell Leaders, Will and Hallie are shoe-ins.